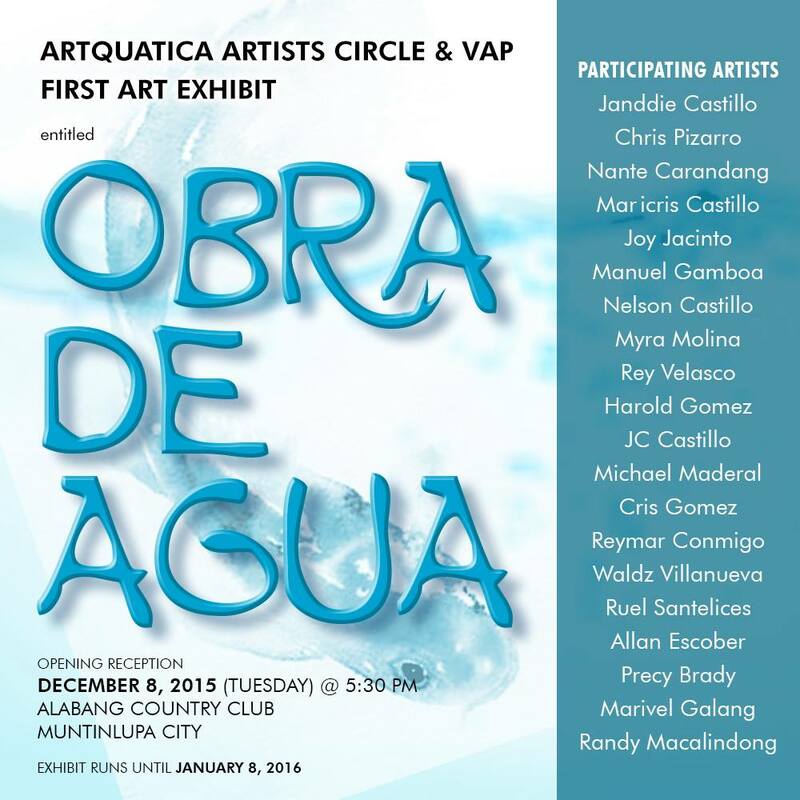 We are inviting everyone to the First Art Exhibit of ARTQUATICA ARTISTS CIRCLE and VISUAL ARTISTS OF PARANAQUE entitled OBRA DE AGUA on December 8, 2015 to be held at Alabang Country Club, Muntinlupa City, Philippines. The Opening reception will be on December 8, 2015 at about 5:30pm and the Art Exhibit will run until January 8, 2016. 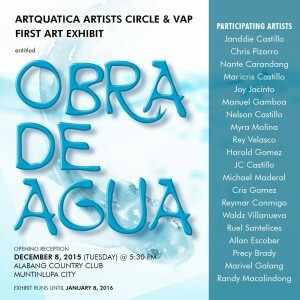 The VISUAL ARTISTS OF PARANAQUE (VAP) is an Art Group of Visual Artists from Paranaque, Philippines, who aims to help and promote the visual artists of Paranaque through various art events and exhibits. Both Art Groups, VAP and AAC are headed by our good friend and a remarkable artist Janddie Castillo. Art works of Janddie Castillo are also featured in our personal art collection at the Macuha Art Gallery in the Janddie Castillo Collection page. Art works of Nelson Castillo, Father of Philippine Miniature Paintings, are also featured in our personal art collection at the Macuha Art Gallery in the Nelson Castillo Collection page. Several art works featuring the marine life will be showcased in this exhibit. Both art lovers and nature lovers will surely enjoy this exhibit. We hope to see you there and be part of this event. Macuha Art Gallery supports and promotes the Philippine Visual Arts and the Filipino Artists.